It was more of a siesta than a F1-esta, but nevertheless there were a heck of a lot of things to talk about from the 2016 Mexican GP. A first-corner masterclass in how to miss your braking point and avoid the corner altogether – as well as a collision, triggered, somewhat embarrassingly, by home driver Esteban Gutierrez – made for an interesting first half a lap, and suggested notions of a thrilling race. But alas it was not to be, amounting to one of the tamest races of the season, with the Safety Car halting the field and in hindsight saving Lewis Hamilton from a potential penalty after he missed Turn 1. 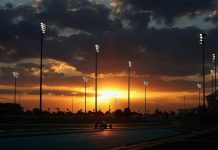 Daniel Ricciardo split his strategy with that of team mate Max Verstappen and indeed most of the rest of the field, with him, Jolyon Palmer and Marcus Ericsson all glueing on a set of Medium tyres on the first lap. Whilst the Renault and Sauber guys would impressively carry the rubber to the end of the race, Ricciardo pitted once more. Let’s dissect the juiciest bits in the Badgerometer! We kick off with one of the lesser-reported tales of the race that was on Sunday; Marcus Ericsson’s quiet but impressive drive to 11th come the chequered flag. We made him Top Dog for the race because of this, and also his incredible 69-lap stint on the medium tyre, a feat, as mentioned, shared with Jolyon Palmer. After the torrid winter of 2014 that Marussia/Manor had, many, myself included, root for the team as the underdog success story against all odds, but it’s worth noting that Sauber’s situation is just as beleaguered, if not more so. There are no points for finishing eleventh, but it’s the closest the team have come to doing so since the USGP of 2015, some 22 races prior. To me, it’s a sad state of affairs when a commentator has to say “If someone in the top 10 retires, Sauber will be close to their first point of the season”, as it implies that the Swiss outfit has to rely on the misfortune of others for success. Some truth in this there may be, with the team not testing this year, barely developing the car from last year, and opting to run a year old power unit in 2017 suggests that they’re not out of the doldrums yet, but this stand-out performance from Ericsson (one he dubbed his finest drive, despite scoring points on five occasions last year) may at least help him keep his seat at Sauber for next year, even if it’s not worth Championship points. 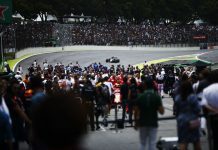 The high altitude nature of the Autodromo Hermanos Rodriguez combined with its super-long straight and the increasing speed of the modern formula led to some quite insane speeds, with Valtteri Bottas recorded at 372.5kph in the speed trap during the race. It’s a tad slower than his speed trap time from Qualifying in Baku earlier this year, where he apparently set a speed of 378kph, but for race data, he was on the cusp of breaking a record. Juan Pablo Montoya’s eye-watering 372.6kph speed from Monza in 2005 is still revered as the fastest for now, but it looks like that record could be broken in twelve months’ time when F1 returns to the Mexican capital. The race in Mexico was one of three acts; The first lap, the last three, and the 67 in between. And while the middle act generally consisted of most drivers behaving and continuing along their merry way, the other two were quite the opposite. Perhaps it’s that the super-long straights of Mexico, combined with the right-angled slow-speed corners afterwards and the notoriously troublesome brake-by-wire stopping power of the current breed of F1 is a recipe that inherently lends itself to missing a braking point. Gutierrez’s messy braking into Turn 1 at the start of the race ultimately led to Pascal Wehrlein’s early retirement after his excellent qualifying, symptomatic of Haas’s recent woes with Brembo. For whatever reason, both Lewis Hamilton and Max Verstappen didn’t slow down in time for Turn 1 either, leading to Nico Rosberg being pushed wide by Max as well. When Max Verstappen locked up into the first corner on Lap 68, it looked like Sebastian Vettel would sneak through into an unlikely podium position, but with the Dutchman scampering across the grass, they remained as they were. Cue a very, VERY incensed Vettel airing his, er, concerns over the radio. We’re not going to repeat what he said on here, but if you watched the broadcast, you probably know of the extent of his ‘effing and blinding’. Vettel then had to defend from the other Red Bull of Ricciardo, and the two made slight contact on the penultimate lap of the race as a result. Though there was no damage suffered, it did make for a messy end to the race. As a result of the above nonsense, Verstappen, who appeared in the cool-down room after the race, was removed from the ceremony, and replaced with Sebastian Vettel, who had run there from Parc Ferme… only for him to in turn have third place removed. There’s just under two weeks until the penultimate race in Brazil. Will Vettel and Verstappen have calmed down by then? Can Hamilton keep the title fight alive until the final race of the year? We shall see.